Everyone makes sure to get their pictures taken with Mickey while they're here, but that isn't the only picture you need to take when you're exploring attractions in Orlando! To show off that you're a true Floridian, there are a few Orlando landmarks you need to get your own pictures of. Not only do these pictures boast how well you've gotten to know Orlando, they'll also provide fond memories of your trip. So if you want to really feast your eyes, here's where you need to go! More commonly thought of as “The Epcot Ball," Spaceship Earth is the giant round golf-ball like structure that classically accompanies any mention of the Epcot Theme Park. If you're in Walt Disney World, stop by Epcot for a shot of this marvelous feat of engineering. Add the landmark in Orlando to any post to feel like an authentic travel brochure! Universal Studios' Wizarding World of Harry Potter features the ride that every child dreams they could take: the Hogwarts Express! Stop by here for a picture that's authentic proof of your magical blood! Keep an eye out for Platform 9 ¾ as well! Come to International Drive, and you'll have tons of pictures to take, whether you're going to Ripley's Believe it or Not, the Museum of Osteology, or a Florida Tour. But the first thing you need to snap a picture of is a street sign boasting “International Drive!" Posting this on social media shows the world you're in the middle of tons of fun - people will understand why you're too busy to text back! Also called the Coca-Cola Orlando Eye, this is one heck of a Ferris Wheel - it's four hundred feet tall! Good luck getting this gigantic Orlando landmark in a single shot! Or, for an even better picture, pay admission to ride the wheel and snap some photos from up top! All of International Drive will be spread out before you! Much of America doesn't get to see churches quite like this, but thanks to the early settlement of the Spanish in Florida, Orlando is left with a gorgeous center of worship. The arches, steeple, murals, and stained-glass fill the cathedral with a sense of reverence. Head to Downtown to visit. 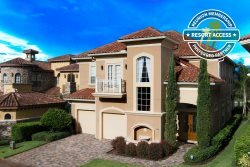 Nothing is quite as beautiful as home after an exciting day; book with Reunion Vacation Homes and get one of the most beautiful homes in Orlando! Call us at 1-855-453-5400 to learn more about our fantastic offers!